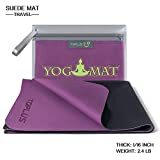 YOGA MAT FOR TRAVEL: 1/16 in thick yoga mat can easily folds up, making it the ideal travel yoga mat. Coming with exquisite carrying bag. TWO IN ONE: This thin yoga mat can be used alone, can also cover the public yoga mat. Enjoy a convenient and clean yoga experience. ANTI-SLIP & MACHINE-WASH: Made by natural suede, the more sweat is absorbed, the more non-slip it is, great for hot yoga. Can easily be cleaned by machine. SKIN-FRIENDLY: Suede material above, non-toxic rubber down, both sides are made by eco-friendly material. Using our foldable yoga mat with confidence. SATISFACTION GUARANTEED: ONE-YEAR warranty for free replacement or full refund. If there is issue, please feel free to contact us. BUY WITH CONFIDENCE!